Restore operating system in Lenovo Idea pad (type from g50 to g70) to factory default settings or a former healthy state with built-in Lenovo OneKey Recovery or AOMEI OneKey Recovery. In most situations, users need to do lenovo g50-70 restore because their current os is already not work. Thus, the computer is off then. There, you can press the Novo Button, which is usually on the upper left corner of the Top nearby the Power button, to enter Novo Button Menu. Then, choose “System Recovery” to get to Lenovo OneKey Recovery. If your current os is still working, and you want to do Lenovo g50 system recovery for some reason, for example, to get back to the state the first time you get your computer, you can directly press Novo Button when computer is on or follow "Start"->"All programs" -> "Lenovo" -> "Lenovo OneKey Recovery" to enter Lenovo OneKey Recovery. There, choose “System Recovery” to reboot into recovery interface. Then, follow the steps to restore system either to factory defaults or to a former pleasant state. Beside Lenovo OneKey Recovery, you can also rely on AOMEI OneKey Recovery to do lenovo g50 system restore, especially when Lenovo OneKey Recovery is unavailable due to “driver failed to initialize”, “program cannot find the service partition” or other errors. Step1. Open AOMEI OneKey Recovery. If computer is off, press “F11” or “A” (according to your settings when you make backups before) to enter it. If computer is in Windows, just double-click its icon. In its main interface, choose “OneKey System Recovery”. Step2. Restore system with the image file in AOMEI OneKey Recovery Partition or other location. It depends on where you have stored the image file before. Step3. Restore and confirm. Choose where to restore system image to. Usually, keep the default destination where your current os locates. You can “Restore to other location” by ticking the box on lower left. Step4. 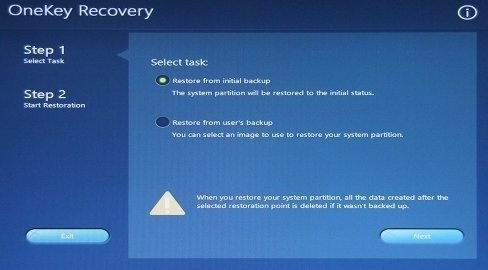 Click “Start Restore” to start lenovo g50-70 recovery. Choice1. Purchase recovery discs from Lenovo support center and recover from the cds or dvds. Choice2. Use AOMEI PE Builder to create a Windows PE into USB on another healthy computer. Put this USB into the crashed computer and boot from it. Then, AOMEI Backupper will pops up. Use AOMEI Backupper to restore the snapped in system image to crashed machine. So, if do not have system image at hand, while your operating system is still in good condition, make a backup of os in advance. Learn more: How to restore Lenovo g50 to factory settings.